Born in 1957 in Lagos, Oluyemi Oluleke Osinbajo is a lawyer, teacher and spiritual leader. He assumed office as the Vice-President of Nigeria on 29 May 2015 under the current President Muhammadu Buhari. Osinbajo became acting president of Nigeria during Buhari’s prolonged absence in early 2017. 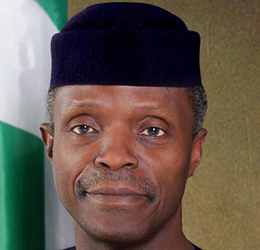 Prior to his inauguration as vice-president, he was the pastor in charge of Lagos Province 48 (Olive Tree provincial headquarters) of the Redeemed Christian Church of God.A graduate of the University of Lagos (LLB, 1978), Osinbajo holds a master’s in law from the London School of Economics (LLM, 1980). He holds the prestigious title of Senior Advocate of Nigeria (SAN). He is the ethics adviser to the African Development Bank’s advisory board and a non-executive director of Citibank. He has also served in various roles within the United Nations including at the United Nations Centre on Transnational Corporations, United Nations African Institute for Crime Prevention, the United Nations Peace Operations in Somalia, as well as the International Criminal Court for Rwanda in Arusha, Tanzania. Yemi Osinbajo is a co-founder and board member of the Convention on Business Integrity and the Justice Research Institute Ltd.